NOTICE: NEW TRUCK LIDZ DESIGNS FOR VARIOUS MODELS OF TRUCKS ARE IN THE PROCESS OF RESEARCH AND DESIGN. MOST TRUCK LIDZ PRODUCTS ARE CURRENTLY UNAVAILABLE AS WE WORK ON THESE NEW DEVELOPMENTS SO THAT WE CAN OFFER A WIDER PRODUCT RANGE TO FIT MORE APPLICATIONS. Sleek design & customization. We match factory colors or patterns. Use our system for your specific cargo or hauling requirements. Made in the USA. Push-to-open latches (locking system) and gas assist shocks for all tonneau & tool box openings. Spacious tool boxes, set 10 inches above truck bed. 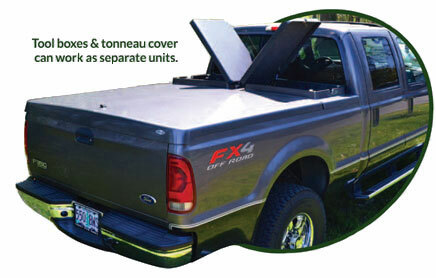 Modular System - The integrated tool box and tonneau cover combination can also be used separately. Use just the tool box, or just the cover (with front access), or use cover and tool box together. Truck Lidz™ sets a new standard in truck accessories, combining tool boxes with their custom truck lids or tonneau covers. They provide versatility and security to haul your cargo, while enhancing the look of your pickup truck. The best truck accessory - practical and great looking aero design. Why is our product the best out there? 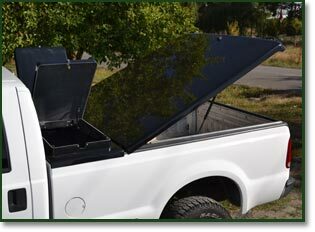 Unlike many other truck lids or tonneau covers Truck Lidz is very versatile; you can remove your tonneau while leaving the tool box still in place, the toolbox storage compartment may be removed to allow full bed access, while having the advantages of a full functioning cover with easy front and rear access. Our equipment is not detrimental to your truck. Everything can be removed, no bolts or screws left in your truck. Our sleek design amplifies the look of your truck. We can color match to most factory colors. Customizable patterns, such as camouflage, are also available. 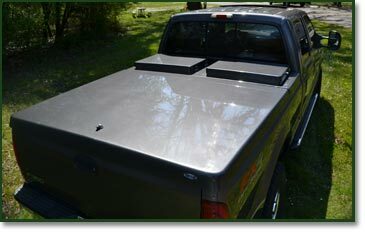 Truck Lidz, the only tool box truck bed cover, it's a tonneau cover with a storage compartment!